pilasters are polygon shaped and protrude on the exterior so as to be almost unnoticeable from the interior, which thus takes on the form of a neatly cut crystal. The light penetrating through the Windows reinforces this crystalline effect while rendering the structure less perceptible. The thickness of the arches is attenuated by the walls between them, which are filled with numerous and ornate Windows, having lost all bearing function. The bareness of the central area, the covering dome of which takes on the purity of a modern concrete structure, also prevails on the four façades, while the general plan has been widened with naves. The outer effect of the mosque is not as successfully achieved as the interior. The four façedes are only made up of four arches and the Windows inside them, but the kiblah wall has been uniguely designed, completely freed of its bearing or abutment function. The polygonal pilasters on each corner. The exceptional height of the body of the mosque and the rising dome generally seem to herald some early baroque era. The minaret, which may have been rebuilt after an earthqueake, is very tall and slim, separated from the main body. 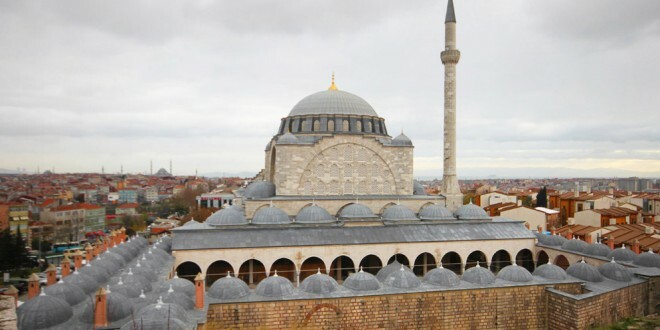 The building presents interesting similarities with mosques build later, such as the Nuruosmaniye (1755), the Ayazma (1760), the Nusretiye (1826), the Mecidiye (1848), the Ortaköy (1853) or the Dolmabahçe (1855), the Cihangir (1889).